Looked upon with praise and renowned newspaper critique, Sophia’s Bistro embraces a modernised tone that leans more towards the simplicity of simple, handmade dishes created with freshness and personal care. 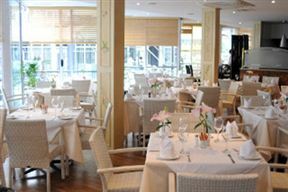 Exuding a light and airy setting, lingering with aromatic aromas of freshly baked stone ground artisanal bread, diners peruse the menu enjoying the likes of fresh line fish, Sole, Scallops, linguine cartoccio – a seafood pasta lightly steamed in a bag and succulent Ostrich burgers and Lamb moussaka. Enjoy Sophia’s signature dishes such as stolen Lamb, veal and steaks or dig into a Meze Platter for two – brimming with dolmades (stuffed vine leaves), saganaki (fried halloumi) Lamb souvlaki and calamari, served with two dips (humus and taramosalata) and pita bread. Try seared Scottish Salmon with verde or chive Sauce - pan seared, succulently cooked, served with hand cut chips or lentil basmati rice and vegetables of the day for mains with a wine recommendation perfectly paired - Grangehurst Chardonnay. Lighter meal choices such as the Souvlakia - Lamb cubes with halloumi, cherry tomato and brinjal served with a side salad or hand cut chips hits the spot in all the right places concluded by ice cream with warm black cherries. 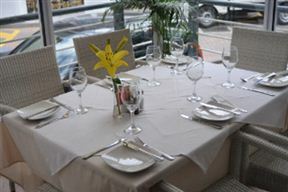 Sophia’s Bistro embraces, quality, simplicity and modern trends refreshing bistro setting in Illovo. +27 (0) 11 024 0311 ​? 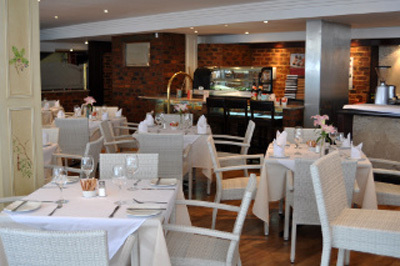 Sophia's Bistro is 0.3km from the centre of Illovo , the nearest airport 20.1km (Johannesburg International Airport).